I’m gonna make this short and sweet, because I’m still sick, and mighty irritated about it. My apologies in advance. 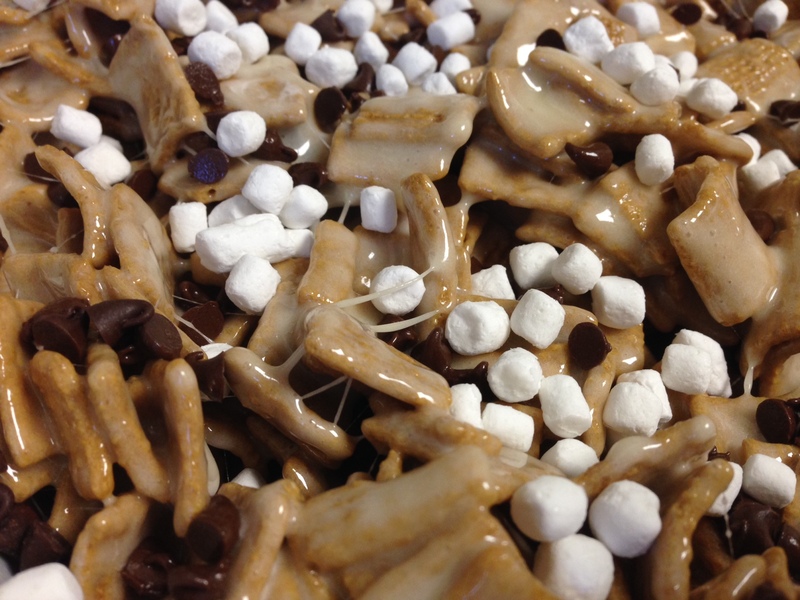 The long and short of it is: s’mores + rice krispie treats = awesomeness. Why I have never made these before, I have no idea… but I will be making them again and again and again, and I will also be adding 50 cents to a special jar every time I eat one, to save up for some bigger pants. *you can certainly use a 10oz bag of mini marshmallows here, if that’s what you have on hand. But, regardless of size, the marshmallows are coated in a bunch of junk to keep them from sticking together – and the more of that coating you have, the harder it is to get the marshmallows to melt into a nice “sauce”. So, fewer, bigger marshmallows means less junk getting in the way of them melting nicely. It’s science, man. 1.) In a large pot set over medium low heat, melt the butter. Once the butter is melted, add the marshmallows, stirring to coat with the butter, and stir until all the marshmallows have melted completely. 2.) Remove the pot from the heat, and add in the cereal. 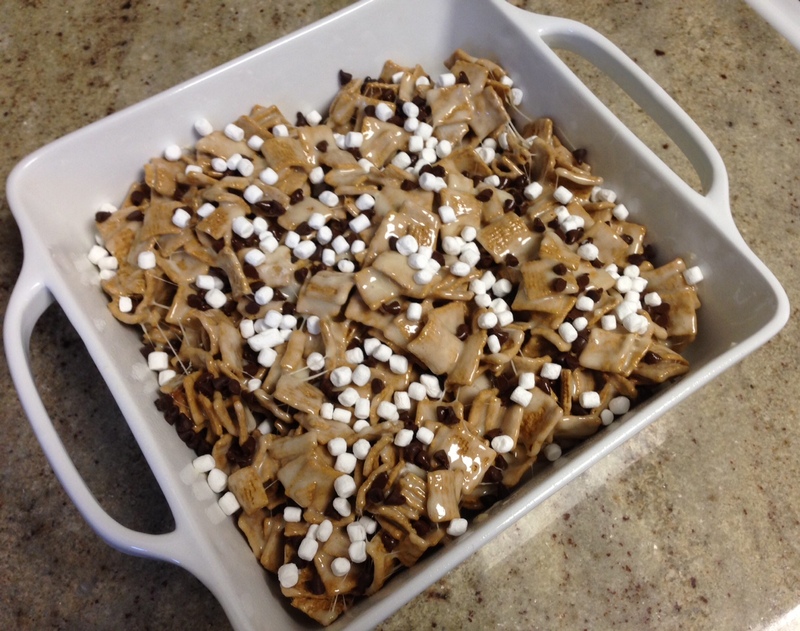 Use a rubber spatula to mix everything together, until all the cereal is evenly coated in the marshmallow butter mixture. 3.) 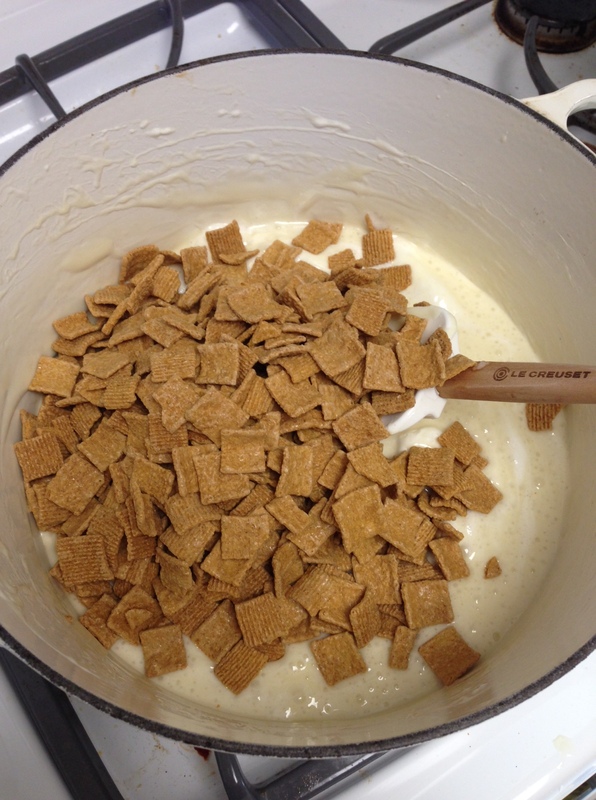 Spray an 8×8 pan with non-stick cooking spray, and scoop the cereal/marshmallow mixture into the pan. Use a rubber spatula to spread the mixture around as evenly as you can, pressing it gently to even it out. Pick any abandoned, marshmallow-coated golden grahams off the side of the pot, the back of the spatula, or the countertop, and eat them immediately. 5.) Once they’ve cooled, cut them into squares, and serve. Enjoy! These are incredibly delicious. Dare I say, they are more delicious than rice krispie treats AND regular s’mores! Thank goodness, there is finally a decent use for that weird Golden Grahams cereal that’s managed to hang on for all these years. Looks so good! Can’t wait to try this! !